May 20th is the official release date of the newest Little Print pattern. I'd like to introduce you to the Revolutions Frock. The Revolutions Frock features a round yoke, waist sash, and long circle skirt, all which pivot around the central axis – your girl. To enter the giveaway, please leave a comment on this post. I will draw on May 19, at 9:00 pm MST. In your comment, if you like, I could really use some help. I'd like to know what y'all think of E-patterns, those that arrive in your email in pdf form. I'm thinking of making a few Little Print patterns avaliable this way, but I'm really worried that it will dimish the accessibility of the pattern. Because I like to make it as friendly as possible :) If you have any experience or opinions about E patterns, please, I'd love to hear about it in your comment. In the meanwhile, I'm going to step away from the computer and get testing the Fair Weather Jacket sizes 5-8 I promised y'all. Good luck everyone, and talk to you tuesday night! Now, I have made the draw and the winner of a hot off the presses Revolutions Frock pattern zine is Angela C.
And for the rest of you commenters, for sharing your wisdom, I would like to offer you 20% off of the Revolutions Frock pattern zine in my etsy shop until May 27th. Just enter in the code 'JUST TUTES' and I will reimburse you through paypal. Again, thanks all! I've got a tutorial sitting in the hopper (okay, my brain, but it's all ready to emerge into a more substancial reality) and I should be back with it in the next few days. Personally I am not an epattern fan. I prefer a nice big pattern sheet that I just need to trace over trying to piece things together. I'm not a fan of puzzles either though. I know some people charge a touch more for printed ones and I'm fine with that. what a gorgeous dress! I can't say I'm a fan or not as I have not had any experience with Epatterns (and no experience with regular patterns since I a NEWBIE to sewing!). OOOH - been looking for a pattern like this one. I havent had any experience with epatterns - pick me and I'll let you know what I think. I would rather have patterns in paper form. I have three girls so dresses get worn a lot around here. That one is too cute! I really like this dress. I think the most frustrating thing about e-patterns is having to blow up the pattern. I have to second what others have said above. For novices, such as myself, I prefer paper patterns for "big" things like shirts, pants and dresses. Hair accessories, bags, etc I can handle e-patterns just fine. Don't get me wrong, I love the internet and all things technology related, but when it comes to patterns and books- I still prefer paper. I am however thrilled about the release of THIS pattern!! My two girly girls will love it!!! Can't wait! Personally, I like epatterns just because sometimes I'm impatient and want that pattern NOW! But I prefer having the pattern on one sheet of tissue that I don't have to piece together and can reuse. Typically with epatterns, I use it once and throw it away just because it's so bulky and inconvenient. Ooh, the dress is adorable!! Love the revolutions frock! I have a little one who will enjoy the circle skirt. I love the round collar. I have no experience with epatterns. Although I'm sure I would like the speediness in receiving it, I would probably prefer a paper pattern when sewing. Never know til you try though! Thanks. Oh, how totally cuuute! My goddaughter would look adorable in that. As to epatterns, I'm not a big fan. They're too fiddly to put together. If it's not hard to offer a pdf as an option, people might like that, but I wouldn't go exclusively pdf. ADORABLE!! Such a great dress...you can do fun summer or dress it up for a great winter look. Love it! This dress is darling. Very "spinny", as DD would say (all dresses are evaluated for spinniness). As for e-patterns - if it is a made of simple shapes (cut 2 rectangles 15 x 22 or some such) - I would rather have that written than given pattern pieces. But for a garment with a bodice - I think I would rather have the paper pattern so I don't have to bother going to kinkos to enlarge or print on different paper. What a pain (and an added cost to me). I am not a fan of e-patterns for bigger things (like clothes) given the blowing up issue. Absolutely adorable! I LOVE e-patterns. So easy to use. Easy to store too. I prefer patterns printed on nice, sturdy paper, but there's a definite benefit to the e-patterns. Instant gratification and a reduced cost certainly make you look twice, especially for spur-of-the-moment projects! The dress is simply lovely. I'd love to make this up for my girls and nieces! That looks like a great new pattern I really like how it is different from alot of the dress patterns for little girls right now. I like epatterns the ones I have used have worked out well. I think as long as they are simple not to large. (I mean to many pages to tape together. )I think it is good to have both paper and epattern so you have a choice. Great Job on the new dress Love it! Hi there - very cute dress and my girls will love it though I can see fights about who's turn it is to wear it :o) I haven't used e-patterns yet but I think I'd rather a printed pattern because then I can use it right out of the envelope rather than having to transfer e-pattern pieces to larger format etc. Then again if it is only available on e-pat. then I'd go right ahead any old how. The dress is adorable! I love using both types of patterns. The only problem I have ever had with an eBook is when it was scaled down, but that was only one pattern out of several I have bought. I don't love e-patterns. I have had a difficult time with them in the past. But, I agree that they are great for hats, bags, accessories.. I love this pattern! I have no experience with epatterns, but I suspect I would prefer a paper pattern. However, I'd give it a go. I have no idea what an epattern is, so I'd like to try this one out. That is a gorgeous dress - and Smootch is cute as a button in it (don't grow up too fast, Smootch)! LOVE the dress, especially in the mint green. I just won a BUNDLE of epatterns from YouCanMakeThis, and...I'm a fan. It's immediately in my hands, and I can reprint if necessary. I say, go for it! E-patterns are nice in that you can have them NOW, but it can be difficult if you need large pattern pieces. I think the best kind of e-patterns are the simpler patterns. Like your patchwork twirl dress where you only really need a pattern for a small bodice, then the rest is just cutting squares. HOpe that helps! PS Can't wait for the jacket in bigger sizes! Yay! I like e patterns like you get from YCMT. Immediate download and easy to store. I would love to win this pattern. I love the dress. Thanks for the giveaway. This is a gorgeous dress! Absolutely stunning. As far as ePatterns - most of the ones I use I have enjoyed. If there are lots of photos to make up for lack of actual pattern, then they work great. All the patterns on YouCanMakeThis.com are pdf and I use them a lot! About the e-patterns, I am not a fan of them. I like to have a 'real' copy to work from. By the way, I am working through your fair weather jacket pattern and its been great so far. I am searching for the perfect outer fabric for it, or I may just settle for something close to get it done. :) But so far, the lining went together beautifully! Oh how precious. I think you come up with some great stuff for that lil one of yours! As far as E-patters I havent had any experience with them yet. I am not too sure how I would feel about them, but they would be much easier to transport! hehe... I am def a person who likes to have the physical item in front of me but this is a technology run world! Love the dress. Love e patterns. They satisfy my need for instant gratification big time. Also selling wise, I've impulse bought e patterns I never would have if I'd had to think about waiting for/paying for shipping. Thanks for the give-a-way! OOh!! I love this dress!! I also have really liked the epatterns that I have used. Both the instant gratification factor as well as the sturdy paper factor are nice. I've gotten to be pretty good at gluing them together, but it does take practice. There was some swearing the first time. It would be great to offer as an option. that is a delicious dress! i would love the pattern! On e-patterns, I have mixed feelings. they are ok, but I prefer the other kind!!! I adore this dress because my hubbie doesn't like my daughter wearing short dresses/skirts so I'm always trying to find pretty longer dress patterns. Personally, I don't mind e-patterns for items of clothing that give measurements for you to cut out - like stripwork skirts or tiered skirts. But when you have to print 20+ pages of just the pattern pieces to make an outfit, then that becomes difficult because you have to reprint for every size change if you want to use the pattern again. So, I guess it depends on the design of the actual item. What a darling dress! I love the instant gratification of epatterns, but truth be told, I prefer to have large pieces that I can cut out and use. oh, its stunning! I'm pretty new to sewing, and haven't tried and e-pattern yet, so I'm not much help there. I think, as a beginner though, I'd be more apt to go for the actual already printed pattern. This dress is adorable! I love epatterns. I've used several. I think it's much easier to print something off. Plus I like that you don't have to wait for it to arrive in the mail or go to the store to get it. as for the print vs. e- pattern issue... i don't mind an e-pattern for somethings [smaller things, like felt foods, baby booties, toys, etc], but i think [personally!] that print patterns are best for clothing items, as you have a big sheet to spread in front of you.. and, theres also no print-and-piece involved. Gorgeous dress. I made a dress with the same neckline and didn't like how it turned out...but THIS dress...with the twirly skirt is AWESOME! I guess I'm an oddball of sorts here because I prefer E-patterns. I like the fact that I can save the pattern and print it whenever I want however often I want. I also love that I can get it almost instantly! Oh, well done! Your tutorials are just awesome and they've been teaching me heaps, I'm pretty sure your e-patterns will be as good as! You are so far my first sewing teacher! I've tried them once and it worked well, and if I can do it everybody can! I just loved this dress! My curly little girl will love it! I have to try it! Have a scrumptious weekend! Sometimes I like e patterns and sometimes I dont. Once I got an epattern and it wasn't scaled right. Your tutes are so easy I am sure that your epattern will be easy too. I ordered the corset dress pattern and it rocked!!! The dress is so cool I cant wait to make my pumpkin one. So pretty! Love the name, too. My daughter would go nuts over this. The green one you made is gorgeous!!!!!!!! Don't have much experience with epatterns, but I really don't like when you have to copy &enlarge the pattern. I don't have a copier in my home that I can do that with, and I'm not trucking out to Staples or wherever to do it either (I live in NYC with no car, so it's not exactly easy to do). Stick with real size PDFs that you can cut out and tape together. It's a bit more work, but at least it's immediately accessible (instead of waiting for a pattern to arrive in the mail). Gorgeous dress! I am a regular pattern fan, but I have never tried an e-pattern. love it! although i've never used ANY pattern before, i am considering starting my collection, and epatterns look like my first choice...simply because i am impatient, and when i want something, i want it now! I've had good and bad with e-patterns. I think my favorite was more of an e-tute than a pattern, and it's by etsy seller oh franson for her cloth shopping bags. Each step of the pattern instruction has a small (I'd guess around 200 pixels square) photo of what that step should look like. That was/is AWESOME since my biggest problem as a fairly beginner sewer is understand some of the terms and explanations that others who've been doing this for year or have made that item a ton of times can do with their eyes clothes so it's not always explained well. What a beautiful dress! I'm new to sewing as well, and your tutorials are perfect for practicing my new skills. Patterns intimidate me, but I want to learn. This dress is ADORABLE and would be perfect motivation! I can't comment on the pattern as I'm a newbie sewer, sorry! Super cute dress ... my grandkids would look so good in that style! I'm not a huge fan of e-patterns because of all the work of printing them out and piecing them together ... and hoping that you get it right! I guess on really simple styles they're okay, but not for anything too complex ... and definitely not for adult sizes. Thanks for your wonderful FREE tutorials. I've been watching this dress evolve and love it! I haven't used an epattern before but I imagine one of the benefits would be that you don't have to hand trace the pattern out to preserve the original... You could just print the size you want, saving time and paper. This was a "cut two rectangles x by x" etc. I probably wouldn't have tried it, but I won it in a giveaway and I loved the pillow. It was easy to put together with clear instructions. I'd be more concerned about a dress or jacket in that form because it isn't squares. I haven't tried a print this out at 200% and cut and sew type. Beautiful dress by the way! I'd love to make this for my niece! So glad to see a date for the release, I've been holding my breath waiting for this pattern. I prefer paper patterns since I have issues with our printer working when *I* want it to work. I'm also leary about printing patterns since it seems I end up with size issues on the few patterns I have printed from online tutorials/patterns. Not a big deal (to me) when sewing something small or not apparel. Love this dress! I don't mind the e patterns for smaller items -- bags or dolls -- but for a dress I'd definitely want a paper pattern. Oh I looooove this dress!!! It's absolutely beautiful! I guess the only negative thing I can say about Epatterns is all the resizing and taping that goes along with them. On the positive side, you can get to work on your project that very day rather than having to wait for the post office. In this age of instant gratification, I have to vote for Epatterns. There are times when I need to have a pattern TONIGHT to make a dress for TOMORROW. I think having them in both formats is good, or maybe, if you sell the pattern in paper format, people get the Epattern free along with it? that way we can start right away, if necessary, but have the nice paper one come in the mail? What a great change, so different from most of little girl patterns. I love it. I personally like e-patterns they come quick and you don't have to wait for the mail. With that said I have never done an e-pattern larger than a 2T. lovely dress! Would be great for my daughter at my brothers wedding! I love e-patterns! Nothing like instant gratification! I don't even mind the printing and taping - it's easier than the tracing of ready made patterns, and you still always have a digital copy if you wreck your paper pattern or need another size. Great giveaway! Please count me in, too! I am a huge fan of your creations! This is a fabulous addition to your collection of wonderful dresses for little girls. As a reader of your blog(s) from across the ocean, I find that I like e-patterns - there is no waiting time for the postman to bring it and I can get stuck into the project as soon as I get the emailed pattern (normally pdfs) and print it off. From a green POV, I'm preferring a little bit of printing (esp if I use recycled paper) to the number of air carbon miles involved in getting my pattern to me! My granddaughter would love this dress, and I would love to see her wearing it. I'm quite comfortable with e-patterns, as long as they have a test square, so that I can measure it before printing out the whole pattern. I prefer to glue the sheets together rather than use sticky tape, and I always trace off the size I want to make so that I can re-use the pattern for other sizes. gorgeous dress. I have really wanted to try out something with that neckline. I love EPatterns. They are fine for me to understand! My feelings on Epatterns- great for smaller things if all I have to do is hit print. If I have to change settings on my printer then I won't bother. Fabulous (as everything you make!). I didn't use to like e-patterns, but now that I have acess to a photocopier that can enlarge the patterns I think it works great. I'm not crazy about epatterns because I always worry about my computer crashing before I print the pattern. I love your patterns though and I'm so glad your little girl is a size bigger than mine!! What a lovely dress. I would love an e pattern. I have used your e patterns and I love all the work you put into them! How gorgeous is that? I love the dress! E-patterns? I agree that it can be really frustrating if the scale doesn't come out right. However, having said that, I just used one and it turned out great. As always....beautiful!! I so wish I had money to buy some of your patterns....lol. I do however love your tutorials on here and share them with many of my friends!! I love the dress. I have two daughters that would love one just like it. What a darling dress!! I am new to blogging and especially all the creative sewing, crafting blogs. I am an experienced sewer, but have not used your epatterns, so cannot comment on that. I have just found your blog and have saved all your tutorials regarding pattern creation. Am looking forward to referring to them as I sew for my grandkiddos!! I love e-patterns, because I am impatient and want to get sewing straight away, and also because I live in Canada, mail from the US seems to take forever (I think that's a fault on our end, not yours! )I have my own system for them, I print them off, and then trace them onto large sheets of tracing paper (this is great when the pattern piece extends over more than one sheet of the printed epattern). I then store the traced pieces in folders like a previous poster. That way I don't ever cut the original, and if I need to make garments in more than one side I can just trace out the size required. I have seen someone else use the paper you can get on a roll that's used in doctors' exam rooms too, as that is quite transparent, and very long, but I haven't found out where to buy them. gadzooks!!! This dress is so great! your patterns are fabulous; thanks for another great one! I like the option of epatterns. Is it possible to offer both? Love the dress.. so cute! I think epatterns work great. It looks like something that Audrey Hepburn would have worn as a girl. I love it. Beautiful, as usual! I've so been dying for this dress, I've tried drafting one before and it would have been lovely if she'd have been able to get her head in it! Only had success with those spool birds in epatterns. Burda stuff is still on 100 pages floating around. Not being a trained sewer I really need the pictures - as in your tutes! So e-patterns with a pic tute is the way for me, especially as I live miles from the American continent! Oh what a cute pattern!! I love the pdf patterns. I guess i'm instant gratification type. Anyway, I think they're wonderful, plus you save on shipping. I've never used an e-pattern, only the tissue paper kind, so I can't be much help answering that question. Love this! Would look gorgeous on my daughter. I just discovered your site recently...wow! Love it! The only e-patterns I have ever used were for smaller and fairly simple items, so I can not comment for larger, or more complicated shapes. I like E patters I guess the fact that having it immediately is a big plus, however the big old fashion are much easier to work with, I have to admit. I LOVE this dress! I don't have much experience with e-patterns, but I do hate waiting to get patterns in the mail if I have a project in mind! E-patterns I love.... because of free shipping, and how quickly I get them... but for bigger items, that would require a lot of piecing... I prefer paper patterns. Too much work, and I never get around to doing it! I think e-patterns have their place and I love them for the instant pattern factor, however I think in some cases (like clothing patterns) printed is best...I'm not sure everyone likes taping sheets together to get the whole picture. I prefer old fashioned paper patterns. There is just something about having the actual pattern that i enjoy. I would MUCH rather pay more for a paper pattern than do an epattern. That's just my $0.02 :D I LOVE this dress! It's absolutely gorgeous! The fabric from the second photo is superlative! That's a gorgeous dress! It's a style that would look wonderful on any girl. So cute! For smaller items I love E-patterns, I can start right away and I don´t need to waste money on shipping. But when the pattern is larger than 3-4 sheets of paper it´s no joy. What a beautiful dress. :) I love e-patterns ... as a knitter I far prefer patterns I can download and have purchased many! As a newer sewer I generally go for free downloads, but I'd definitely get this as a pdf. Thanks! Super cute dress! And I'm excited for the jacket in bigger sizes, too, yay! As for e-patterns, I personally like them. I download a lot of the patterns I use and prefer them because then I don't have to retrace them onto sturdier paper. I just print them off on the paper I want. Not as many torn pattern pieces. Personally I prefer paper patterns. Love this dress - so cute but also sophistocated (for those little girls who think they know it all, and we all have one of those at home!!). As for e-patterns, haven't really used them. When I have used downloaded freebie patterns I prefer it when they are at actual sie (and then stick the pages together) rather than having to take it to a print-shop for enlarging or printing. Great work - landed here from "One Pretty Thing". This is just the pattern I have been looking for for my daughter, I look forward to it being available :). As for epatterns it depends what it is a pattern for. I love the instant gratification of an epattern (I'm in Aus so mail times can be an issue) but I also don't have a printer at home so they are not easy for me to print. Given the choice I would probably pay a little more for a printed pattern. i've been lurking your site for sometime...never get aound to say hi.... but this is a gorgeous dress!!!! I have to say it! I love that the yoked top only buttons on one side. I'm curious to see how you did the trim on the skirt. Is it circular too or just a strip? So cute! Very cute. I have bought one epattern before and I have mixed feelings about it. Overall I prefer a hard copy. Love all of your patterns, this one especially! I know my chances are slim because of all these comments but I just can't resist entering. This pattern just looks fantastic! I think that e-patterns are great. I do think you should always have the other available though because I think some sewers and people just don't feel comfortable with them. oooohh - this is gorgeous! Thaks for sharing so freely, your tutes are awesome! This dress is adorable and I can't wait for larger sizes on the Fair Weather Jacket. I made size 4 for my daughter and while she should be able to wear it for the fall, next year it mostly likely won't fit her anymore. I like e-patterns for smaller, easier items. I also like that if you lose the printed pattern you can always reprint it. I don't like having to worry about scaling the pattern, my printer acting up, running out of paper or ink, etc. For some reason, the larger patterns don't seem to line up correctly if they take multiple sheets of paper for each piece. I think I would be more willing to pay a little extra and wait for it to be mailed to me to have a full size pattern (no taping, yay!). I like online printable patterns and never mind the extra work, but I'm not as willing to pay as much for them. I can't wait to make this dress! Too cute! My little girl would look adorable. I love this dress !! My daughter has one dress that has a round yoke and it is WAY adorable ! For the E-pattern, pdf format will be ok i think.. it the best way to view. Another option in jpeg (picture) format. but if it have a lot of writing, i think pdf will be most suitable. Love the dress :) Congrats ;) Personally, I dont really like E patterns unless they are for knitting or something. For clothing patterns I prefer to be able to trace off the size I need at full size and not have to draft it or photo copy it larger as its really difficult for me to get to one. 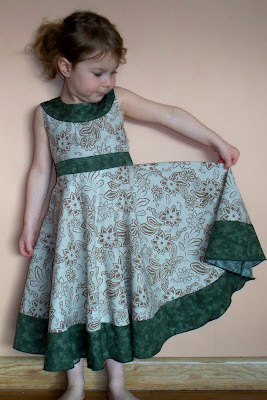 I have never tried an E-pattern but my girls love "princess" twirl dresses. I can never make enough to satisfy them! I only use e-patterns because they are truly inspired and unique. Pictures make all the difference. Especially to a beginner. I've been making tunic tops and boutique pants... I'm ready for a great dress pattern. Beautiful pattern; I love it!!! As for epatterns, I like them because they're instant gratification. However, I can see how someone not experienced in sewing/following patterns may not like them. I would love for my daughter to wear this. Very cute. What a beautiful little dress! I'd love to be able to make this for my two little girls. I would love to make that dress for my grandchildren. I'm personally OK with an e-pattern. I like the instant gratification of seeing something online, buying it, and being able to dig in asap. Great pattern. Would LOVE to win it. epattern's are just fine with me. Love the dress and I know a almost 6 year old who would love it even more. I have never tried an e-pattern but am willing to give it a go! Thanks for the giveaway, love your blog. Beautiful dress! I have never tried an e-pattern, but I think I'd prefer a paper pattern anyways since I always seem to experience technological difficulties! Love this pattern! Not so much a fan of epatterns. I never have paper big enough. I love your blog and your patterns:) Hope I win!